Our relationship with the folk at adidas has seen us take on a wonderfully broad range of work. 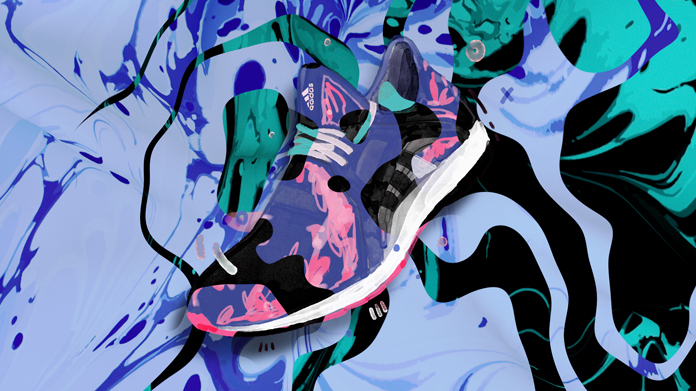 Most recently, we wanted to find a way of bringing to life some of the more technical and aesthetic aspects of the PureBOOST X women’s running shoe through their social channels. With an audience as vast and as engaged as adidas’, we found the best route was going to be to use owned social channels. So it was that we worked with the wonderful Kate Moross (who has designed and art directed for the likes of Disclosure, Kwes, Sam Smith, Jessie Ware and One Direction) to create a series of three animated films. Each focused on a different aspect of the shoe – the BOOST technology in its sole, the floating arch that wraps the foot and the colourways the brand launched the new shoe with. They’re going down a storm across adidas Instagram, Twitter and Facebook channels and are on track to clock up tens of thousands of views and engagements. More than meets the eye. @StudioMoross brings the colour and style of #PureBOOSTX to life. Explore the full spectrum now. What you put in you get back! @StudioMoross shows how #PureBOOSTX provides energy in every single step.